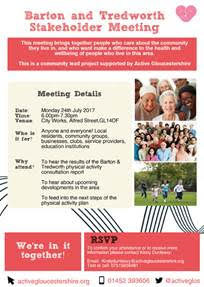 I can now invite you all to attend a meeting regarding an update on the Barton and Tredworth physical activity plans including the results of the consultation work we lead and what’s next. This is a very exciting and important session to attend if you are able to as there is definitely things beginning to happen because of the work you guys have done in the last 6 months (thank you for this!). Again, we are happy to facilitate this meeting but this is your community and we urge you to be involved and to have your voices heard. Please share with colleagues, friends and partner organisations so 1. they are aware of this work and 2. they can input and be involved. · Who should attend: Anyone and everyone! I would love to see more local residents, community groups, businesses, clubs, service providers, education institutions, volunteers attend – people of all ages and abilities should be involved with this project. Please share this information with personal and professional contacts and let me know if you/others will be attending – please confirm this by Thursday 20th July 5pm. In the meantime, any questions, please ask!